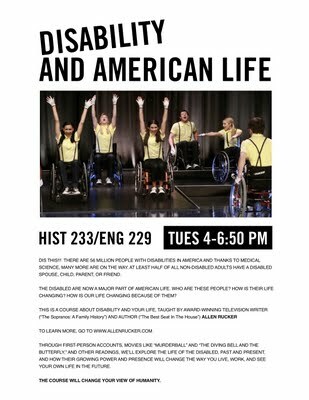 I've been asked by the good people at CHAPMAN UNIVERSITY in Orange, CA to teach a class in the fall on disability and American life. My good friend and fellow crip, ROBERT SLAYTON, esteemed historian and author of a great book on Al Smith ("Empire Statesman"), teaches there and set this thing up, which is great. If you know any kid who goes to Chapman, please pass the word. Thanks so much. Coming up in MAY issue of NEW MOBILITY MAGAZINE: a piece called TWO STORY HOUSE, about paralysis and marriage, ie, my paralysis and our marriage. Check it out on line after 5/1 at http://www.newmobility.com/ or better yet, buy a subscription. Actually, check out this month's issue on NM on line right now. Great cover story on medical marijuana called RX FOR DOPE.